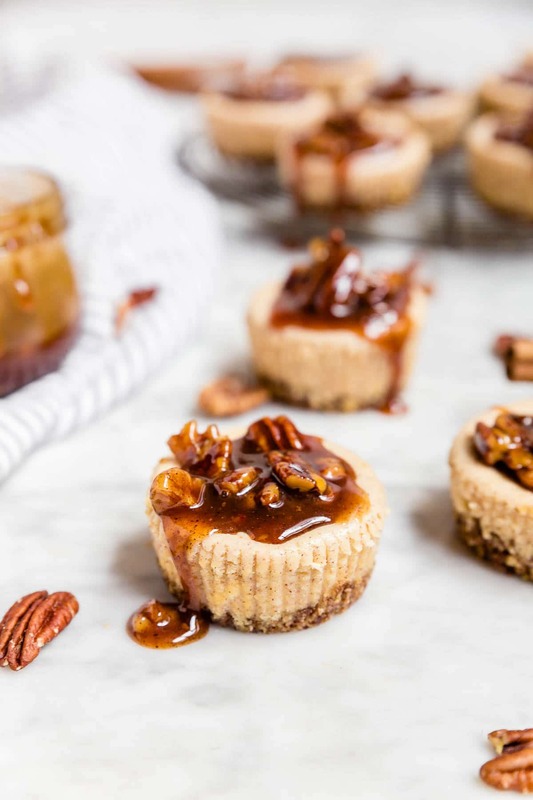 These mini pecan pie cheesecakes are gluten-free and grain-free with a spiced pecan crust and topped with a decadent pecan pie caramel sauce. Perfect for holiday entertaining! They’re easy to make ahead and a delicious dessert for any party – whether you’re hosting or bringing a dish to share. I just love mini portable desserts, don’t you? They’re just so perfect for entertaining. Anything that is easily grabbed from the dessert table to keep the party going is always preferable. Especially in instances where sit down tables aren’t provided. Don’t get me wrong, I LOVE full sized cheesecakes. But if you don’t have somewhere for your guests to sit down and eat their cheesecake with a plate and fork… then these mini pecan pie cheesecakes are the way to go! Plus, they’re just so dang cute! I have a little gluten-free, grain-free trick when it comes to my cheesecakes. Nuts! They make the perfect grain-free and gluten-free crust for cheesecakes. Yes, yes. A graham cracker crust is quite delicious. But, sometimes I want to make cheesecakes on a whim and I don’t always have gluten-free graham crackers on hand. Plus, if you want these to be grain-free… well nuts are the answer! I’ve been using nuts to make my cheesecake and tart crusts for some time now and the amount of flavor and texture they bring are INSANE! In fact, some of my gluten eating friends and family even prefer this pecan crust to traditional graham cracker crust. 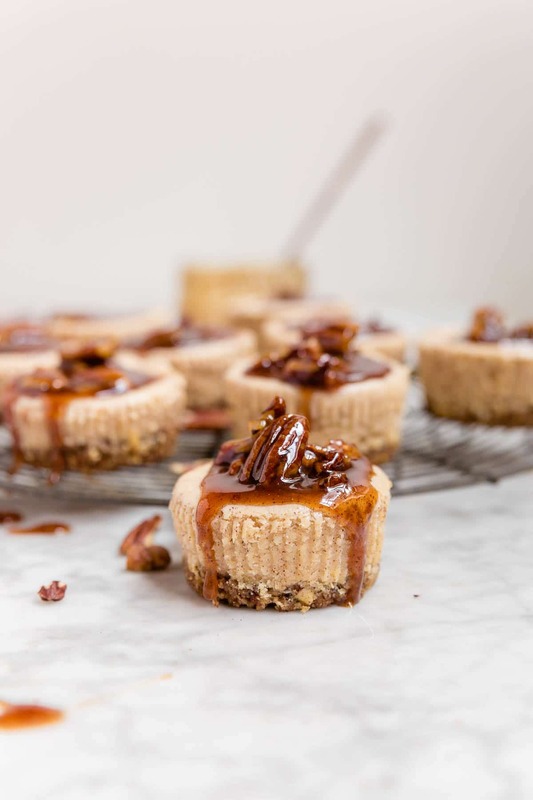 For this grain-free cheesecakes recipe, I used pecans because well… pecan pie cheesecakes should have pecan crusts obviously. The secret is to start with toasted nuts. You can either purchase your nuts this way, or toast them yourself. Toasting nuts doesn’t have to be scary. It honestly just takes a few minutes to do. There are a few ways you can toast nuts – either in the oven or on the stove. My preferred way is the stovetop, because it just seems simpler and less of a process. To toast nuts on the stove, just place your nuts in a large skillet over medium heat. Let heat up and toast for a few minutes, stirring frequently to ensure they toast evenly and do not burn. Since pecans are dark in color, I can usually tell they are toasted by smell rather than color. There will be a warm, roasted pecan aroma in the air. Once you smell that, take them off the stove top and proceed with the recipe. Use paper muffin liners for easy baking! There is nothing worse than greasing a muffin tin and then not being able to get your cheesecake out of it. So trust me on this one. Paper muffin liners are your friend. I typically don’t sere my mini cheesecakes with the muffin liners on. I unwrap just before serving. Allow your cheesecakes to cool completely! While this recipe doesn’t take too long to make, there is some down time needed to let the mini cheesecakes cool completely. Once they are out of the oven, let cool. Then, place them in the refrigerator for at least an hour. However, overnight works and makes these easy to make ahead for entertaining. There’s some magic that goes on in the refrigerator that makes these cheesecakes all dense and perfect and stick to your sides delicious. Spoon the pecan pie caramel sauce over the cheesecakes just before serving. Short on time? Use store bought caramel sauce. Yes. I said it. You CAN use store bought caramel sauce. I do like to make my own because I add in spices to make it truly a pecan pie caramel sauce. However, if you are short on time, I get it! The holidays can be crazy or as my boyfriend would say CRAY CRAY. He likes to sneak in 13-year old girl slang whenever possible. Use the store bought caramel sauce if you wish. I’m going to go all Ina Garten (my fave!!!) on you and say use the best one you can find. Like, let’s not use the artificial stuff that says caramel flavored topping for this, okay? 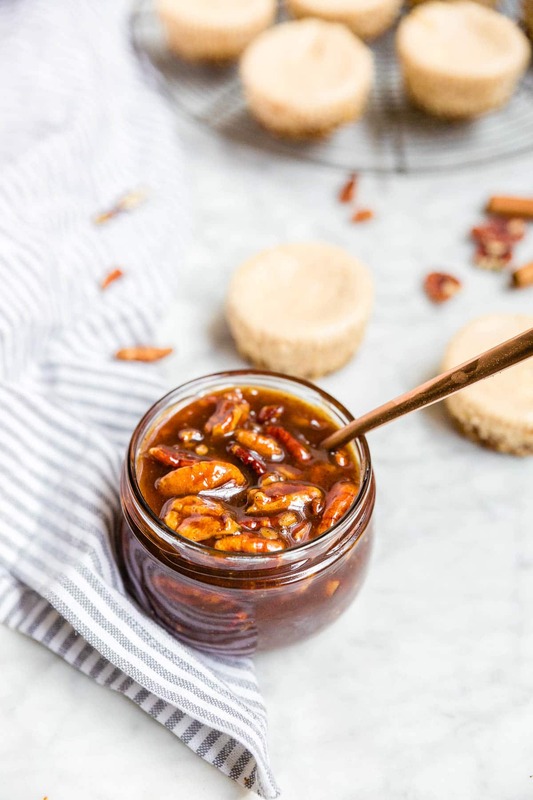 Use a true caramel sauce and mix in some toasted pecans. Boom, pecan pie caramel sauce. Or just make my homemade pecan pie caramel sauce. I swear it’s not as intimidating as you might think. And it’s WORTH IT! Love these mini cheesecakes? Here are some other portable gluten-free desserts that are great for easy gluten-free entertaining! 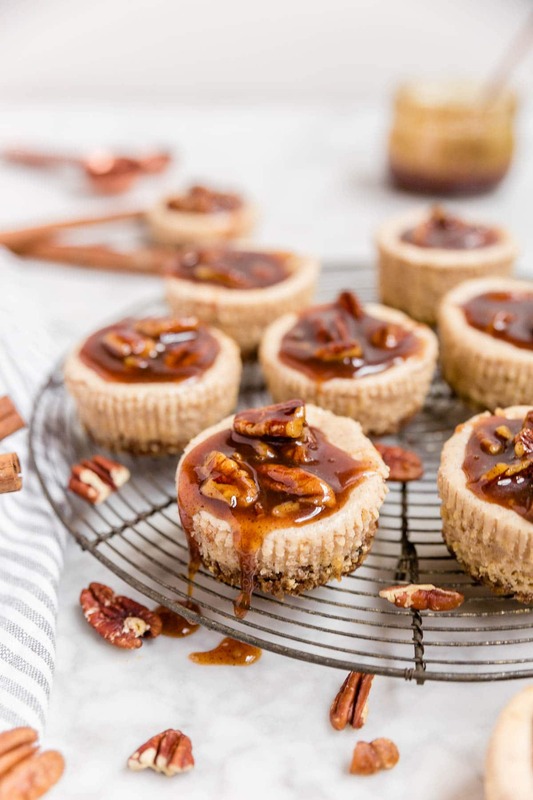 These mini pecan pie cheesecakes are gluten-free and grain-free with a spiced pecan crust and topped with a decadent pecan pie caramel sauce. Perfect for holiday entertaining! Preheat the oven to 350F. Line a muffin-tin with 12 paper muffin cups. Set aside. Add pecans to a food processor. Combine until finely processed. The consistency should be similar to sand. Some slightly larger pieces of pecans is fine, too. Pour pecans into a medium sized bowl. Add in brown sugar, cinnamon and nutmeg and stir to combine. Pour melted butter over the pecan mixture and mix until butter is dispersed and all of the pecan pieces are moist. Add about 1 heaping tablespoon of the pecan mixture to each muffin well. Press down with the bottom of a glass cup or a measuring cup to create a flat surface in the pecan crust. You want to press down pretty hard so that the crust sticks together. Set aside. Add the cream cheese to a large bowl. With an electric mixer, beat for 2 minutes, until the cream cheese is smooth and light. Add in the sugar and beat for another 1-2 minutes until completely combined. Add in the eggs and vanilla extract and mix combined. Stir in the cinnamon and nutmeg until evenly dispersed. Using a spoon or cookie scoop (my favorite), portion out the cheesecake mixture between the 12 muffin cups. Bake at 350F for 20-22 minutes, until the tops are lightly browned. Remove from oven and let cool completely. Then set in the refrigerator for at least an hour, but overnight is better. To make the pecan pie caramel sauce, combine granulated sugar and water in a small saucepan over medium heat. Swirl the pan to combine the sugar and water as the sugar melts (don't stir as it can cause crystallization). The sugar will melt completely and then the mixture will start to turn from clear to a very light brown to finally an amber. Once it reaches amber, take off from the heat. Immediately pour in the heavy cream and whisk to combine. The mixture will bubbly violently so be cafeful. Return to the heat and stir until smooth. Once smooth, remove from the heat and add in the butter, cinnamon, nutmeg, cloves, vanilla and sea salt and stir to combine. Let sit for about 5 minutes to cool slightly, and then stir in the pecans. Let cool completely. Store pecan pie caramel sauce in the refrigerator until ready to use. You can let it sit at room temperature to soften or reheat in the microwave for about 15 seconds. When ready to serve cheesecakes, pour pecan pie caramel sauce over each individual cheesecake. You can serve the cheesecakes in the paper muffin cups, but I like to remove those before serving for a beautiful preseneation.